NOTE: This proposal was approved on 2011-06-13. We are no longer collecting "proposed committers" in this wiki page. Volunteers who wish to get involved in the Apache OpenOffice project should join the project's mailing list and introduce themselves and their interests. In addition to to building the OpenOffice.org product, as an end-user facing product with many existing individual and corporate users, this project will also be active in supporting end-users via tutorials, user forums, document template repositories, etc. The project will also work to further enable OpenOffice.org to be used as a programmable module in document automation scenarios. OpenOffice.org was launched as an open source project by Sun Microsystems in June 2000. OpenOffice.org was originally developed under the name of StarOffice by Star Division, a German company, which was acquired by Sun Microsystems in 1999. Sun released this as open source in 2000. OpenOffice.org is the leading alternative to MS-Office available. Its most recent major version, the 3.x series saw over 100 million downloads in its first year. The most recent estimates suggest a market share on the order of 8-15%. The OpenOffice source is written in C++ and delivers language-neutral and scriptable functionality. This source technology introduces the next-stage architecture, allowing use of the suite elements as separate applications or as embedded components in other applications. Numerous other features are also present including XML-based file formats based on the vendor-neutral OpenDocument Format (ODF) standard from OASIS and other resources. OpenOffice.org core development would continue at Apache following the contribution by Oracle, in accordance with Apache bylaws and its usual open development processes. Both Oracle and ASF agree that the OpenOffice.org development community, previously fragmented, would re-unite under ASF to ensure a stable and long term future for OpenOffice.org. ASF would enable corporate, non-profit, and volunteer stakeholders to contribute code in a collaborative fashion. Supporting tooling projects will accompany the OpenOffice.org contribution, providing APIs for extending and customizing OpenOffice.org. Both OpenOffice.org and the related tooling projects support the OASIS Open Document Format, and will attract an ecosystem of developers, ISVs and Systems Integrators. ODF ensures the users of OpenOffice.org and related solutions will own their document data, and be free to choose the application or solution that best meets their requirements. The OpenOffice.org implementation will serve as a reference implementation of the Open Document Format standard. We understand the intention and value of meritocracy at Apache. We are particularly gratified to learn, during the discussion on this proposal, that there is a strong role for non-coders to participate in this meritocracy and as they demonstrate their sustained commitment and merit, to take on additional community responsibilities. The initial developers are very familiar with open source development, both at Apache and elsewhere. Apache was chosen specifically because Oracle as contributor, and IBM as Sponsor, as well as the initial developers, want to encourage this style of development for the project. A diverse developer community is regarded as necessary for a healthy, stable, long term OpenOffice.org project. In some cases the development effort for the derived project consists of repackaging the core OpenOffice.org code with additional plugins, fonts, clipart, in other cases an additional language translation is added bundled with additional language tools (spell checking dictionaries, grammar proofers), and in other cases the development work involves changes of the core components. In some cases the communities coordinate closely with the parent OpenOffice.org projects, in other cases they have effectively "forked" into independent projects, and in some cases we really have no idea who they are or what they are doing. For example, screen shots of the secretive North Korean "Red Star" computer system indicate that it is likely using a customized version of OpenOffice. The above community relations are as much social as business. The annual OpenOffice.org Conference has, for many years, been an important event on the calendar for community members, a "gathering of the clans" and generally brings in the "extended family" of projects, often including non-OpenOffice.org based projects that interoperate with OpenOffice.org via the OpenDocument Format (ODF) document format, e.g., Google Docs, Microsoft Office, AbiWord, Calligra Suite/KOffice. We want to continue this tradition with members of any eventual Apache OpenOffice TLP, in conjunction with the extended community of derived projects. One of our goals with this incubation project will be to rationalize and formalize the coordination of these upstream and downstream contribution, basing it on the Apache 2.0 license, which should help us disseminate enhancements to the core more easily, since this license is easily consumed by all derivatives, even those with copyleft licenses. We need to identify which functions performed by the broader network of communities are a good fit for an eventual Apache TLP, and which things fit better outside of Apache.We also need to respect that the maintainers of these derivatives of OpenOffice.org have a lot of pride in their distributions and value their independent names and websites. So it is not reasonable to expect that they will wish to be folded into a single "vanilla" Apache OpenOffice.org. However, we must do what is possible to encourage and further develop a thriving ecosystem around this project. One possible outcome is that we encourage the core development of the editors to occur in Apache, while making it easy, via a modular extension mechanism, a modular install, etc. for others to customize and redistribute as permitted by the Apache 2.0 license. The LibreOffice project is an important partner in the OpenOffice.org community, with an established focus on the GNU/Linux community as well as on Windows and Mac consumer end-users. The Apache OpenOffice project will seek to build a constructive working and technical relationship so that the source code developed at Apache can be readily used downstream by LibreOffice, as well as exploring ways for their upstream contributions to be integrated. There will be other ways we will be able to collaborate, including jointly sponsored events, interoperability 'plugfests', standards development, shared build management infrastructure, shared release mirrors, coordination of build schedules and version numbers, defect lists, and other downstream requirements. We will make this relationship a priority early in the life of the podlet. The initial set of committers include developers and other contributors to OpenOffice.org, as well members of other derived products, open source and commercial, including Symphony, RedOffice, LibreOffice, EducOOo, etc. These committers have varying degrees of experience with Apache-style open source development, ranging from none to ASF Members. Since its origins, OpenOffice.org has had a healthy group of volunteers committed to marketing with "MarCons" in many countries. There are existing initiatives that combine marketing with the possibility of raising independent funds, for example through EU grant applications related to the Life Long Learning programme, the certification project and developing the selling of marketing collateral around the OpenOffice.org brand. There is potential to independently raise money to substantially improve the quality and take up of the code that was not realised previously. Write code together : train students to OpenOffice.org source code, create new features, experiment and reverse the best code to be integrated, following the OpenOffice.org Education Project model and the EducOOo effort. The developers of OpenOffice.org will want to work with the Apache Software Foundation specifically because Apache has proven to provide a strong foundation and set of practices for developing standards-based infrastructure and related components. Additionally, the project may evolve to support cloud and mobile platforms from its starting point of desktop operating systems. We are encouraged by the strong initial response that news of this proposal has attracted, quickly growing from two to over 80 proposed committers. Among those names are individuals who have been involved with this project for 10 years or more. In addition to the individual volunteers, there is a significantcorporate committment. The risk, as in most projects, is to grow the project and maintain diversity. This is a priority that is keenly desired by the community. The initial developers include long-time open source developers, including Apache Members. 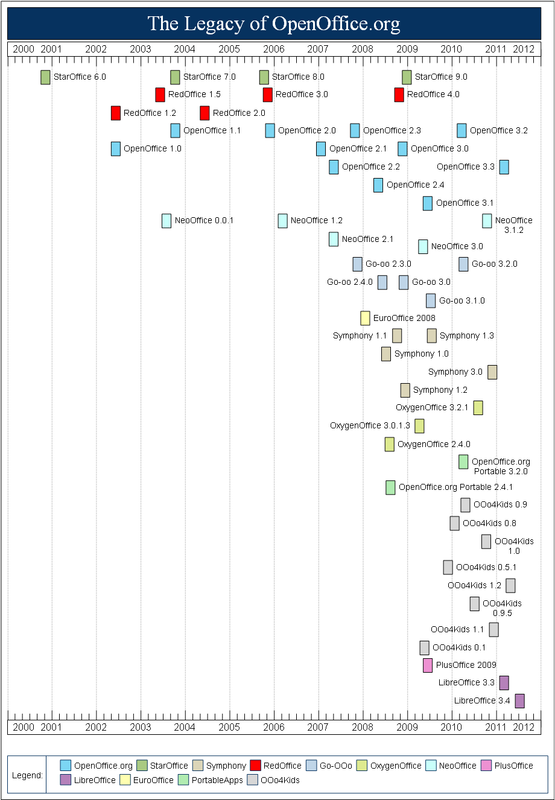 Although the vast majority of proposed committers do not have Apache experience, they do have open source experience. For example, the names from *openoffice.org addresses were involved with the project previously. The inexperience risk is also mitigated by the strong list of mentors who have signed up to support this project. OpenOffice.org for many years was managed by Sun, who provided the majority of its engineering resources as well as its direction. Moving this project to Apache enables a new start and provide a broad framework. We intend to engage in strong recruitment efforts in order to further strengthen and diversify this project. In terms of geographic diversity, the project has strong European participation. This reflects the historical core of the development effort in this project. We wish to diversify this more, especially encouraging greater participation from CJK, India and South America. The initial group of proposed committers does not appear to be dominated by a single company. However, when we look at sponsored developers, with the ability to work on this project full time, IBM clearly has more committers. We beleive that this situation will change, as the project developers. The value of this code under a the permissive Apache 2.0 license will attract and encourage opportunities, not only for existing software vendors, but also for new ventures. This is a new opportunity, not previously permitted to the same degree by the project's previous license. This combined with a strong recruitment effort will help remove the project reliance on developers from any single company. Apache Tika is a generic toolkit for extracting text and metadata from various file formats. Improving ODF support with tools from OOo is an obvious area of interest for Tika. OpenOffice.org in itself is a very strong brand. Our primary interest is in the processes, systems, and framework Apache has put in place around open source software development more than any fascination with the brand. Additional reading on OpenOffice.org can be found at the existing project's website. This part is mandatory, and an important step in the organization. The initial source will consist of a collection of OpenOffice.org files as specified in Oracle's submitted SGA. OpenOffice has external dependencies, including source and binary, required and optional, under a variety of licenses. A list of these dependencies can be found here. Note: This task will be aided by the help of project members who work on IBM Lotus Symphony, who are familiar with many of these issues from a similar effort done on that product. OpenOffice.org supports digital signatures and encryption of documents. The project will complete any needed export control paperwork related to these features. Note: It is recommended that after this proposal is accepted, that there be a consultation with ASF Legal Affairs on the trademark *before* any project infrastructure is created. Note: a users mailing is not being requested at this time. It is anticipated that users will interact with the community through existing OpenOffice.org systems, which are forums, based on phpBB. A JIRA issue tracker: short code "OOo"
TBD: some idea of how much build infrastructure measured in hardware. Oracle will assist in the transition and migration from OpenOffice.org. All of the content has already been archived and is ready for the ASF infrastructure group to act on. Note: Now that the proposal has been approved, we are no longer collecting initial committers in this wiki. Please see the instructions at the top of this page for how to join the project's mailing list and how to get involved. In order to help encourage the creation of a broad and diverse project built upon merit, as required of an Apache project, we have not loaded the initial committer list with contributors from a single company. Our intention is for the initial committer list to be representative of the various users of OOo code. It is perfectly all right to have your name on this list if you contribute in another way than to commit program code (please maintain alphabetical ordering).